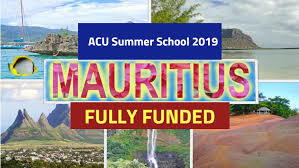 The applications for the ACU Summer School 2019 are invited from the eligible candidates as this program is fully funded and it will be managed in Mauritius. The ACU Summer School of this year will be started from 14 to 21 July 2019 in Mauritius and all expenses of the selected candidates will be covered. ACU stands for “Association of Commonwealth Universities” and it announces that next ACU Summer School will be managed at University of Mauritius from 14 to 21 July 2019. The eligible candidates can join us in Mauritius for one week and you can listen to lectures by local and international speakers, social events, engage and challenge the project in the group work. The undergraduates and master degree holders and PhD students will get the learning from site and visit to Mauritius hospitals and laboratories and they will work together on group project, share experiences of public health challenges in home countries and they will get involved in the Mauritius culture. Education, detection, prevention and control of disease outbreak, community-centered approaches. Innovation in health: e-health and big data. Health economics, policies, and civil society. The event is multi-disciplinary: It is suitable for such studying fields including public health and students from other disciplines. Students, who have previously attended ACU Summer School, are not eligible to apply. Most Meals and Airport pick-ups. However, bursaries do not include the cost of visas and vaccinations. Note: If you will not be selected for Full Funding, You can join us through Self Funding. The candidates should note that last date to Apply for ACU Summer School 2019 is 23:59 GMT on Sunday 13 January 2019. Applicants will be contacted at the end of March.